Are you looking for marquees to buy or hire in East Anglia? Do you need to find quality marquees in East Anglia for an event? 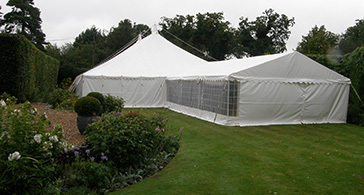 The best place in East Anglia to hire or buy quality marquees is Weatherill Brothers Ltd in Watton, Norfolk. We have more experience than anyone in the business, and can supply you with just about anything marquee related, whether it’s one of our signature large traditional canvas marquees, or something smaller in a trendy Bedouin style. We also provide interiors, flooring, linings, French doors, and everything else you need for those special events. Call us on 01953 882394 and let us know how we can help you. Weatherill Brothers Ltd started manufacturing, selling, and hiring out marquees in the 1950’s. We’ve been based in Watton near Norwich since 1981, but our history as a family business can actually be traced back to the 1800’s. In the marquee business there are a lot of ‘fly by nights’ peddling inferior tents and marquees, so you don’t last as long as we have unless you’re doing something right. We base our business on core values of quality products and exemplary customer service, and our reputation is rock solid. When you become our customer you’ll see that nothing is too much trouble. We’ll advise you on the pros and cons of different types of marquees, and we’ll give you a same day, no-obligation quote. We’ll also pay a visit to your site if we need to, and we can provide on-site assistance at your event too, just to make sure everything goes perfectly. If you’re looking for marquees in East Anglia, calling Weatherill Brothers on 01953 882394 makes perfect sense.